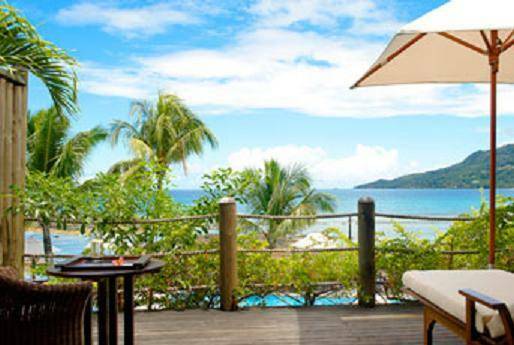 Located on the Northern coast of Mahe on Beauvallon Beach one of the most beautiful beach of the island of Mahe, Le Meridien Fisherman's Cove 5* is synonymous with charm and tranquility. 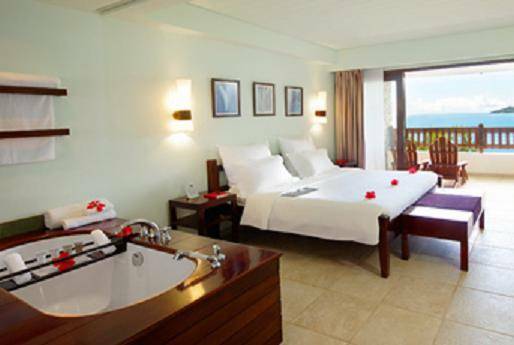 The hotel enjoys an exceptional situation and all rooms have sea view. 30 minutes from the airport and only 15 minutes from Victoria city. 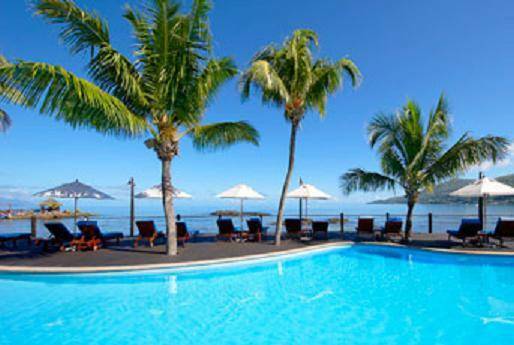 Beauvallon is a lovely little resort where there is bars, restaurants, shops and a wide choice of water sports. 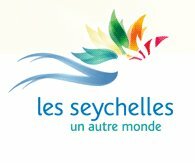 Beauvallon is the only place where you can do some motorized watersports in Seychelles. 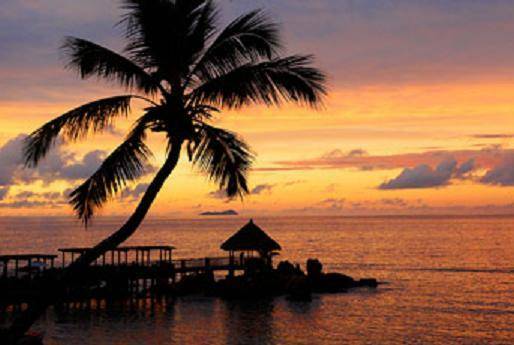 the fine sandy beach is the largest of Seychelles (about 3 km long), the hotel Meridfien Fisherman's Cove is situated at the extremity of the beach. Le Meridien Fisherman's Cove has a very beautiful colorful flower garden . 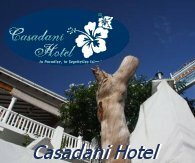 Its room and suites are well appoi,ted in a setting facing the sea. A SPA with 2 massage rooms and a fitness center , a hammam , as well a large pool overlooking the sea are available. Historically ,Le Meridien Fisherman's Cove has been rewarded for the quality of its service , a combination of comfort and excellence in a unique and contempory style that highlights the advantages of the natural tropical environment.The culinary experience , wellness and relaxation as well as a landscape of beauty to take your breath just waiting for you . 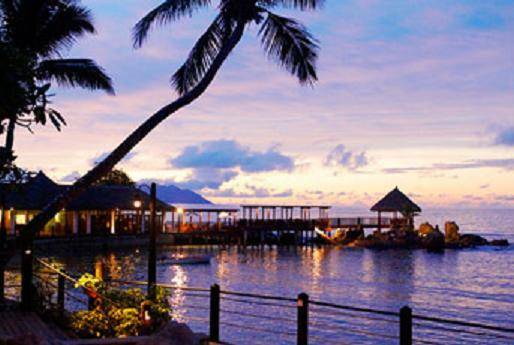 The Meridien Fisherman's Cove is synonymous with peace , tranquility and luxury , his suites attract sophisticated and cosmopolitan clients. All rooms are facing the sea and decorated in an exotic style, with a large bathroom , air conditionning , Television satelite , Video , hairdryer , safe , Minibar , Wifi. The decor of the rooms is inspired by the warm and colorful local environment .The rooms have a King Size bed and all have a terrace or balcony. They are spacious 35 sqm for the superioir rooms and 45sqm for the Deluxe and Junior suites and 55sqmare for deluxe suite and fully equiped with modern facilities and tea and coffee facilities.The superior and Deluxe rooms have a maximum occupancy of 2 adults and 1 baby for comfort so that the family and executive suites can accomodate 2 adults and 2 children under 12 years old. The 19 Superior Rooms with an area of 35 m² each have sea views and are located in the main building. They all have a large terrace facing the ocean with a deck chair and a coffee table. The decor is nice. rattan chair and desk. Wi-Fi in a room with extra charge. TV 32'. King size bed. Seychelles landscapes decorate the walls. 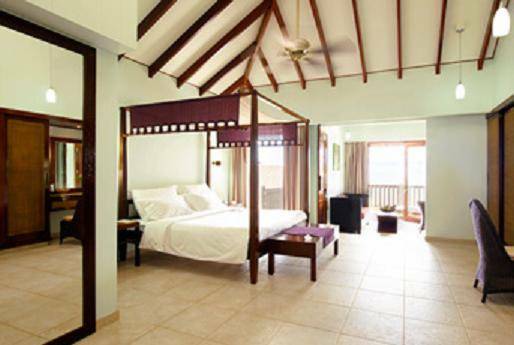 the Nice Deluxe rooms 45 sqm offers a superb vue on the Bay of Beauvallon from their large terrace equipped with a parasol and a law table and rottan chair.they are all over the property. The Tone of white and cream gives a nice atmosphere to the Deluxe rooms. A large sofa and a desk . TV . 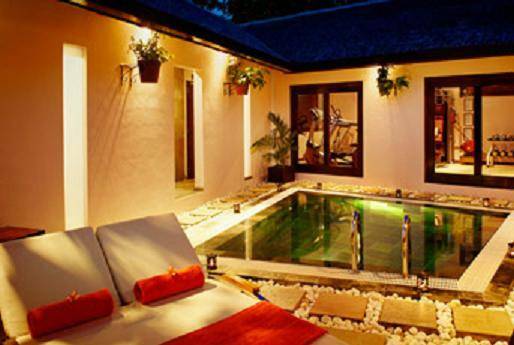 Internet access high speed .Nice bathroom with bath and shower and rainy tropical effect . The outdoor terrace of our Junior Suites features a sunbed, sun umbrella and table for your comfort. The sitting area is furnished with a large sectional sofa that opens into a sofa bed. mini bar is fully stocked for added convenience. A spacious desk is complete with High Speed Internet Access for a fee, while a 32-inch LCD television features and extensive menu of satellite channels. CD player and iPod docking station. Two steps separate the bedroom area, complete with a king-size LM BED dressed in crisp white linens and topped with multiple pillows. Reading lights hang on the walls on either side of the bed. The outdoor terrace of our Junior Suites features a sunbed, sun umbrella and table for your comfort. The sitting area is furnished with a large sectional sofa that opens into a sofa bed. mini bar is fully stocked for added convenience. A spacious desk is complete with High Speed Internet Access for a fee, while a 32-inch LCD television features and extensive menu of satellite channels. CD player and iPod docking station. two steps to the separate bedroom area, complete with a king-size LM BED dressed in crisp white linens and topped with multiple pillows. Reading lights hang on the walls on either side of the bed. The adjoining bathroom is a modern haven—its open-layout features a freestanding soaking tub, an open rainforest shower, two vanities, plush bathrobes and slippers, and ample Cinq Mondes toiletries. 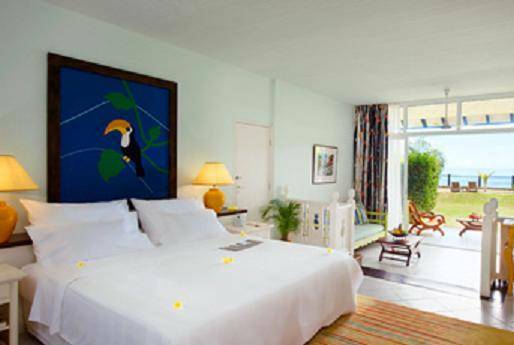 The Deluxe suites are 55-65 sqm big and facinf=g a nice tropical garden, the are nicely decorated with beautiful exotic vibrant fabrics adorn the suites. A large king size bed in the main room. A sofa bed is in the living room. A large flat screen TV is fixed on the granitic wall. a nice terrace all in wood is equipped wit sunbeds and a table and a large unbrella. You have tea and cofea facilities. Cinq Monde skin products are also given in the bathroom. Possibility of connecting rooms for large families. The hotel Le Meriden Fisherman's Cove also has a beautiful pool and tennis courts . Non motorized water sports including sailing catamarans and windsurfing are available at no additional charge. Reception , gift shop , currency exchange , safe rental , concierge , laundry service , car rental , fax and computer, Room service from 7:00 to 23:00 , room games. the Hotel Meridien Fisherman's Cove offers a fitness center and a SPA with thalassot therapy, aromatherapy , manicures and pedicures and body wraps . All water sportsincluding water skiing , parasailing, diving center and deep see fishing are available on the beach of Beauvallon with supplement. yacht outings can also be arranged with extra charge. Choice of two restaurants feature a good selection of international and local dishes in an elegant, yet relaxed, atmosphere. Discover the local touch, smell, taste of creole cuisine; experience a-la-carte fine dining and unwind yourself whilst sipping exotic cocktails accompanied with breathtaking views of the ocean. Le Cardinal : This is the main restaurant of the hotel with magnificent views of the sea , it is open for the breakfast and dinner and offers theme nights with "thev treasure of the sea" or " the round of the world tour of delights" and "Creole party" with occasional musical entertainment. Restaurant serving mediteranean and local cuisine also serving snacks , exotic cocktails bar, coffee shop. open for Breakfast 07:30 to 10:00 and dinner 19:00 to 22h30. You can also take part in our theme nights-different each night- as "Discover the treasures of the world tour ofthe sea" or " a round of the world tour of delights" and "Discovery of the indian ocean specilalties" or "Evening Creole" . A menu "Ala carte " is also available. 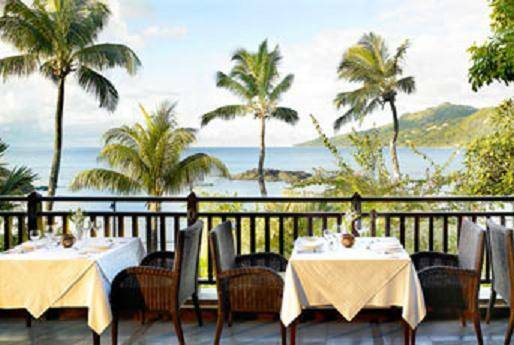 Le Bourgeois restaurant : Located outdoors in the northern part of the hotel it offers a spectacular view of the beach of Beauvallon. There you will serve Mediterranean and local cuisine, seafood and light snacks . Le Bourgeois restaurant is open for lunch and dinner. Under the stars you can participate if you wish to our weekly theme events like "Extravagance BBQ" , however at the bar a wideselection of exotic cocktails is offered until closing at 22 pm . The menu "a la carte " offers a range of tasty dishes with flavors of the indian ocean in a warm atmosphere with a magnificient view on the beach of Beauvallon. 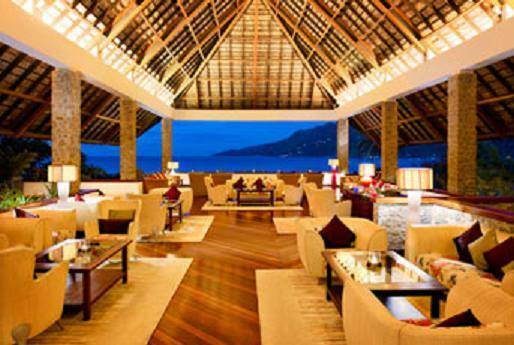 A large selection of dishes and wines to make a discovery of senses of creole cooking or the sea. Cocoloba bar : Designed to provide our guests an exceptional view on the ocean , the Cocoloba offers delicious cocktails with tropical flavors and the cocktail of the day , prepared by our talented bartendersuntil the bar closedat 11.30 pm .You can also enjoy small snacks during the day. Very nice sunset for aperetif lovers in the late afternoon. Sunset Bar open air ideal for a refreshment during the day , tea coffee, sodas ,exotic cocktails ior alcol are served on the jety served with home made pastries . FREE CANCELLATION * up to 21 days before arrival! 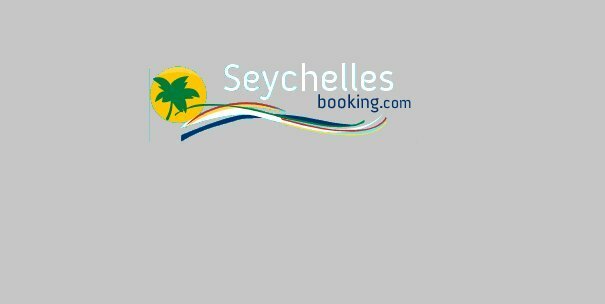 *FREE CANCELLATION * up to 21 days before arrival!